Uganda is set to commemorate World Cancer day that will be held at Kampala capital city authority (KCCA) Lugogo Grounds on from February 3 to 4, 2019. Cancer is one of the vicious diseases killing tens of people in the country. In 2018 Uganda cancer institute (UCI) registered 32,617 new cancer cases and 21,829 deaths in the Country. The various types of Cancers in Uganda which include; Prostate Cancer, Kaposi Sarcoma, Cancer of Esophagus, Liver Cancer and Lymphoma among men. Cervical Cancer, Breast Cancer, Kaposi Sarcoma, Cancer of the Stomach, Lymphoma and Liver Cancer among Women. Cancers among children include; Leukemia (Cancer of the Blood), Burkitt Lymphoma, Cancer of the Kidney, Cancer of Bones and Muscle. Speaking at ministry of health headquarters, Minister of State for Health for Primary Health Care, Dr. Joyce Moriku Kaducu said the commemorations will be premised under the theme ‘I am, I will’, Peddled at creating public awareness on Cancer prevention, detection and treatment measures. She said vaccination against cancer of the cervix is at each sub county and immunization post in the country, noting that the Current HPV vaccination stands at 70 per cent. Government is however undertaking a number of interventions to reduce the burden of Cancer through increasing the budget of Uganda Cancer Institute to Shs8.4Bn in 2018/19 financial year, availability and accessibility of Cancer treatment medicines. She said among the innervations in the fight against the disease, UCI has acquired two radiotherapy machines one with support from government of India and the other is procured from USA adding that by April or May, UCI will have three functional radiotherapy machine that will help in fast tracking against the epidemic. “Government is also in process of establishing Regional Cancer Centres in Gulu, Arua, Mbarara and Mbale caring for over 20,000 patients. 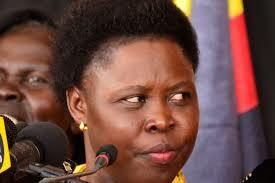 Gulu Regional Cancer Centre will be open in 2019/2020,” she said.